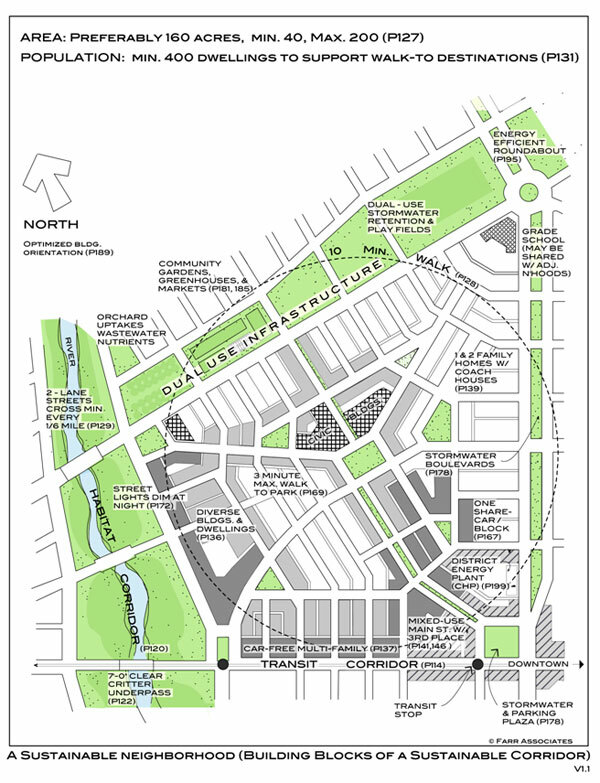 The Neighborhood Unit: How Does Perry's Concept Apply to Modern Day Planning? In the 1920’s, Clarence Perry introduced a concept that he referred to as “The Neighborhood Unit“. The image below is a sketch published by Perry in 1929 illustrating the relationships between the residential components of a neighborhood and the uses that could easily be traversed to and from by foot. Perry utilized the 5-minute walk (See The Five-Minute Walk: Calibrated to the Pedestrian) for more information) to define walking distances from residential to non-residential components, in particular Perry was very concerned about the walkability to and from schools. Clarence Perry's "Neighborhood Unit" Diagram, 1929. The “Neighborhood Unit” has since laid the foundation for modern-day planning movements including the “new urbanism” movement of the 80’s, 90’s and today. Unfortunately, the “neighborhood unit” concept has also provided fuel for today’s suburbanization and road classification system. False interpretations of Perry’s concept have conceived segregation of land uses, further validating the modern-day road classification system and unfortunately created an auto-centric society in today’s first ring and outward suburban communities. Perry’s intentions were calibrated to the human foot, not the automobile. Please remember that Perry’s Neighborhood Unit was conceptualized prior to an automobile-based society (1920’s). His notes on the plan above refer to walk distances, narrow streets and a mix of uses. Note that there also is a fairly connected network of streets, another modern-day casualty from the road classification system. You do not see cul-de-sacs in the diagram above and in fact you see a lot of intersecting streets on highways and arterials. With today’s road classification standards, intersections with this frequency are not permitted on arterials, let alone highways. The following graphic is an interpretation of the neighborhood unit created by Farr Associates, Architecture and Urban Design. The Modern Day Neighborhood Unit Diagram. Graphic by Farr Associates. Cheshire Bridge is a mile stretch of 2 lane corridor, which runs along I-85. The street was originally developed in the 40s as the restaurant row in Atlanta and a first ring suburb with warehouses behind the major street. Not much has changed architecturally, the usage, however, has changed considerably with neon lights of female silhouettes, smoke shops and adult video stores. Since the down turn in the real estate market, many projects have stalled for the redevelopment of this area. Cheshire Bridge and the intersection of Piedmont has a similar configuration to the neighborhood plan reconfigured by Duany Plater-Zyberk with two major corridor intersecting in a acute angle with current CSX rail line running in the back of the neighborhood and a new transit plan in place to run adjacent to it. South Fork of Peachtree Creek, which Cheshire Bridge crosses 1/2 mile north, also run along the CSX rail line, which would be an interesting focal point for parks and green space. CBBA is currently reaching out to businesses and land-owners in the area to organically create a neighborhood that reflects closely to Clarence Perry’s community plan within our 1/4 mile radius.